NN-VS-161 Chanares, San Luis, Argentina. Origin and Habitat: Gymnocalycium berchtii is endemic to Argentina, where it occurs in San Luis. Even though this species has a small range (extent of occurrence approximately 1,000 km2) is common and abundant, and the populations are stable. Altitude range: This species grows at elevations of 700 to 1,200 metres above sea level. circulation are mostly smaller and deeply submerged between the stones. Accompanying species from the Cactaceae family can be Gymnocalycium lukasikii, Gymnocalycium lukasikii ssp. emilii (aff. borthii), Gymnocalycium ochoterenae, Gymnocalycium achirasense, Acanthocalycium spiniflorum, Echinopsis aurea and Opuntia sulphurea, Notocactus submammulosus, and on some lower-situated habitats also Gymnocalycium borthii, Eechinopsis leucantha, Pterocactus tuberosus, Austrocylindropuntia salmiana and Cereus aethiops. At some habitats can be found Gymnocalycium sutterianum. There are no major threats for this species. Even though there is goat grazing in the area, the plants are not affected and they benefit because the grass is kept short and there is not competition for light. Description: Gymnocalycium berchtii is a tiny geophyte, with a solitary flattened stem slowly growing atop a thick, underground taproot. It is not common in collections or in catalogs, may be due to the dark and unattractive colour of his body, but more certainly because of its slow growth (it much faster grows underground, with its big napiforme root) and perhaps also its difficulty to adapt to culture. This species shows a large variability of spination. The 3 to 5(-7) spines are minimal, thin, about 1 centimetre long and adpressed to the body, occasionally with one central spine. Most of the plants have black-brown spines and some of them very light ochraceous with light brown bases. The flowers grade from pearl-white to lilac with brownish pink throat, and are out of all proportion to the body almost 8 cm long, and up to 6 cm wide, probably to attract the attention of pollinators and Gymnocalycium collectors on a plant otherwise almost invisible. Derivation of specific name: This member of the Cactaceae family was given this name for Dr. C. A. Ludwig Bercht , Dutch cactus hobbyist and Gymnocalycium specialist. Stems: Solitary, flattened with slightly sunken tips, dull blackish grey or blackish brown, to 2 cm high, 4-6 cm in diameter. Areoles: Oval, with white to yellowish wool. Flowers: Funnel-form, mother-of-pearl coloured to rose, 5.3-7.9 cm long, 4.3-6 cm in diameter. Fruits: Elongate globose, grey-green, 21-42 mm long, 9-20 mm in diameter. Gymnocalycium morroense Kulhánek, ?epka & J.Proch. : Distribution: Sierra del Morro, San Luis, Argentina. 2) Trevisson, M., Demaio, P. & Perea, M. 2013. 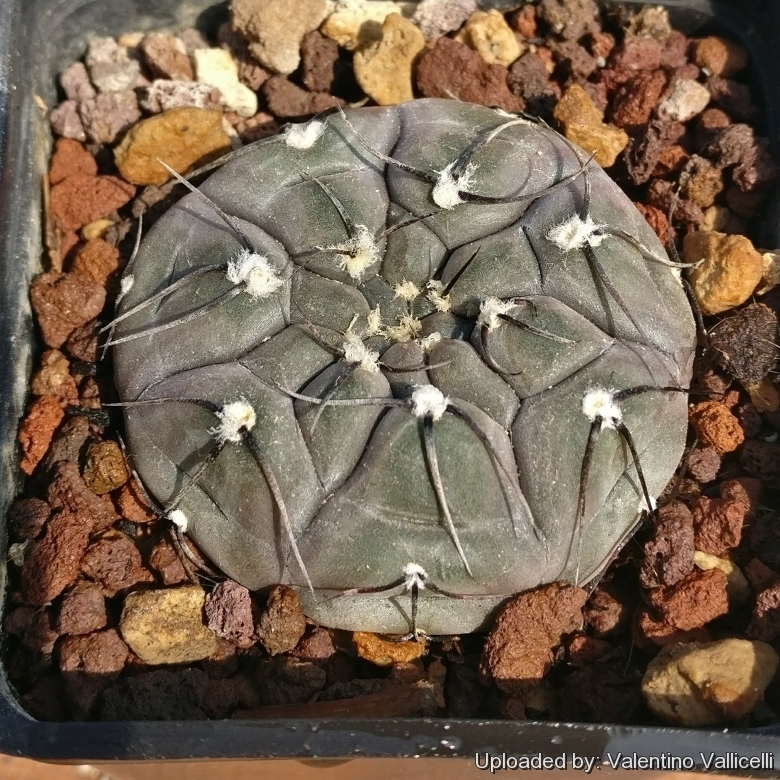 Gymnocalycium berchtii. The IUCN Red List of Threatened Species 2013: e.T152432A636287. http://dx.doi.org/10.2305/IUCN.UK.2013-1.RLTS.T152432A636287.en. Downloaded on 08 November 2016. 3) Hunt, D., Taylor, N. and Charles, G. (compilers and editors). “The New Cactus Lexicon.” dh Books, Milborne Port, UK. 2006. 4) Charles, G. 2009. 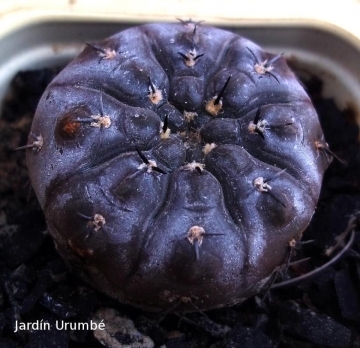 “Gymnocalycium in Habitat and Culture.” Graham Charles, Stamford. 5) Eggli, Urs; Newton, Leonard E. (2004) "Etymological Dictionary of Succulent Plant Names." Springer. 6) 6) Tomáš Kulhánek “Gymnocalycium berchtii species-group: Part one - G. berchtii Neuhuber” Schütziana, The Gymnocalycium Online Journal Volume 2, Issue 1, p. 5-28, 2011. 7) Till, H.; Amerhauser, H. (2008) “Ein fast vergessenes Taxon: Gymnocalycium sutterianum (Schick) Hosseus.” Gymnocalycium, 21(3): 783-790. 8) Till, H.; Amerhauser, H; Till, W. (2008) “Neuordnung der Gattung Gymnocalycium,” Gymnocalycium, 21(Sonderausgabe): 815-838. 9) Neuhuber, G. J. A. (1997) “Eine in den Sammlungen Europas bereits gut bekannte aber unbeschriebene Art aus der Provinz San Luis, Argentinien: Gymnocalycium berchtii,” Gymnocalycium, 10(3): 217-220. 10) Detlef Metzing “Nacktdistel und Spinnenkaktus Die Gattung Gymnocalycium.” Sonderausgabe der Deutsche Kakteen-Gesellschaft e.V., 2012, S. 99. Cultivation and Propagation: Gymnocalycium berchtii is a very slow growing species that is not easy to cultivate as most gymnocalyciums are. Growth rate: It is a slow growing but easily flowering species. Repotting: This plant needs plenty of space for its roots, also provide a pot deep enough to allow the development necessary for its long root. Repotting should be done every other year or when the it has outgrown its pot. Use pot with good drainage. Hardiness: Reputedly resistant to frost if kept on the dry side prior to, and during, cold weather (hardy to -5 C ° C, or less for short periods).